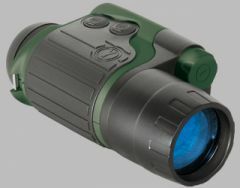 This is an irc30 FLIR thermal imaging camera. 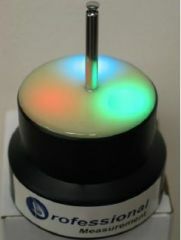 This camera registers and records heat signature from the enviroment and uses different colors to let the user understand the various temperature changes taking place around. Very helpful in darkness. Ever hear a noise but you can not find the source. Say if a cat makes a noise and hides behind something in the basement. You are not going to find it with your flash light but you can see the heat signature of the cat even if hiding behind something so you can rule out paranormal activity and not report false positives. UPDATE-2/2013-We got one fairly credible pic with this cam in about 12 months of field use. For what it cost and it's limitations of no ability to stream the video to a recording device we decided to sell it for other gear. It only takes still pics in terrible resolution.- not recomended. 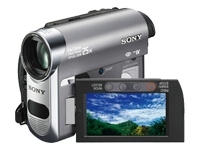 Sony Handycams with nightshot. These cameras have been around for a long time. The infared night capabilities of these cameras are top of the line. We use the mini-dv version. We have obtained moving apparitions with this cam using nightshot. Simply amazing footage that will make your hair stand up. UPDATE-2/2013-Best static camera for the money if you can find them. Ours are all ebay purchases and work well. Get a quality IR illuminator for larger areas.-highly recomended ! Moditronic corp. in Florida is making some really great engineering breakthroughs in full spectrum technology. We own one of the first proto type fullspec cams from Moditronic. What these do via specially engineered filters is allow us to photograph objects in the low ultraviolet spectrum and the high infared spectrum at the same time while filtering out the visable light. We took it on its maiden voyage to a cemetary in broad daylight and captured several apparitions using the still shot option. We only use this model in daylight. It works! UPDATE-2/2013-not manufactured anymore we have had some good evidence with this camera. It does not work in the dark AT ALL ! If you can get one cheap on ebay it is worth playing with. 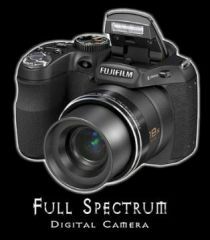 The Fujifilm S1800 camera has a special quality that allows us to capture pictures of apparitions in the dark using the cameras onboard flash. Ours is unconverted and gives great results. 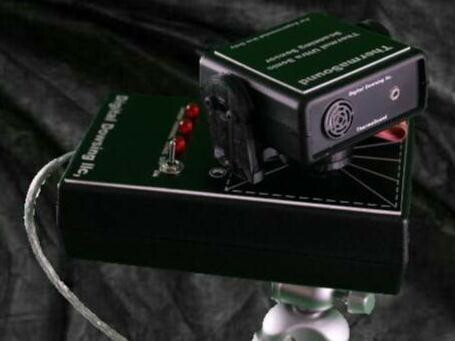 The camera pictured is converted to full spectrum by one of the ghost hunter supply stores and I have seen this model on ebay also. This was well worth the investment. UPDATE-2/2013-over 100 pictures captured with the standard S1800 fuji camera. 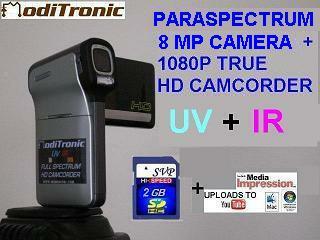 We use this camera UNCONVERTED and we get amazing results with it.-highly recomended ! 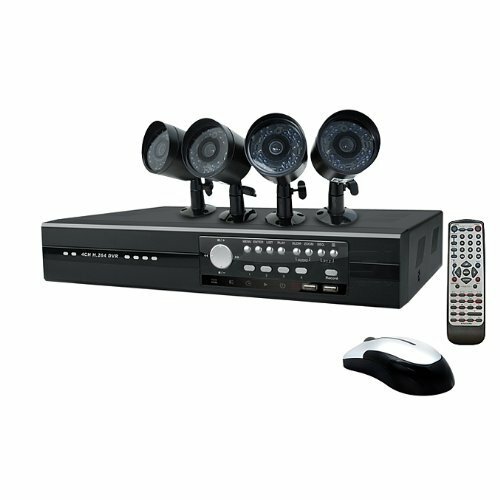 DVR System. We use a four channel DVR to station infared cameras in area for constant surveilance as this can be left unattended and reveiwed at a later time. UPDATE-2/2013-We have captured some of our most compelling evidence with our DVR system- highly recomended ! Above is pictured the E-POD AMP by DAS. This will cover a 12 x 12 room. 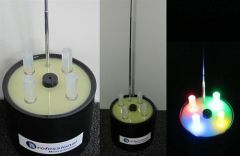 This device has three range lights to alert the user as to how close a field disruption is to the device. No audible alarm.UPDATE-2/2013- no credible results in over one year of field use. Just released by DAS is the new REM-POD. 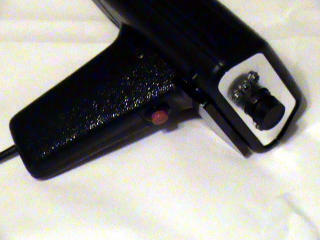 This device is simular to the E-POD but has an audible alarm and foru range led indicators. This is cutting edge technology released in August 2011. I have seen these used impressively on the Ghost Adventures show and the Ghost Hunters show. UPDATE 3/2013- We have been testing these pods in the field for over a year now and have never had a spirit interact with these devices. They are very overpriced and in our opinion do not work with paranormal research. The only time these things sound off is when you transmit with a FRS or GMRS walkie talkie within range or you interact with them. Save your money-not recomended. Digital recorder. 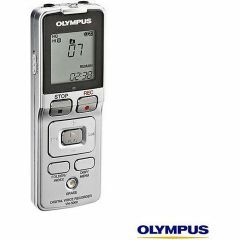 We use the olympus PC downloadable recorder. This advancement in technology eliminates the noise from the tape recorders we used in the past . Holds up to 400 hours or so of recordings. We capture many clear spirit vioces with this nmodel. UPDATE- 3/2013- We have captured hundreds of samples of CREDIBLE evidence with the audio recorders- highly recomended ! RT-EVP recorder by DAS. Once again DAS has provided the para field with more cutting edge technology. This very unique digital recorder allows the user to actually have a conversation with a disembodied entity. How ? The machine has a delay function and a ghost box function built in. Ok first the delay. In the past we had to ask questions and wait to hear the responses after leaving the site or rewind to hear any possible response. The RT (meaning real time) Has a user adjustable delay so you can set for say 30 seconds. Using the ear buds included after you ask a question you hear that question played back and any response from the entity you have contacted. A must have for para research. 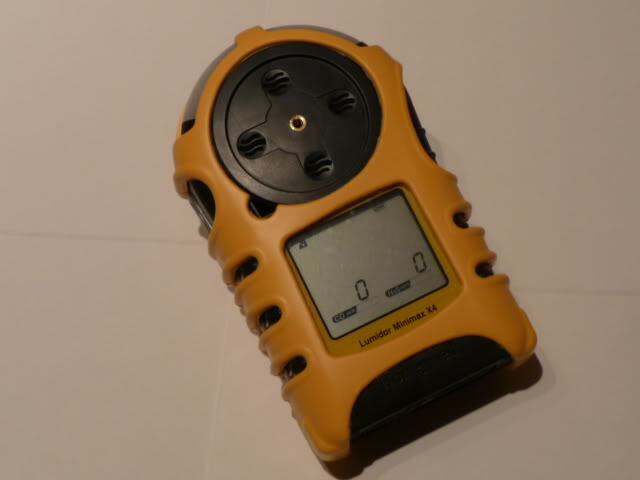 UPDATE-3/2013- After over two years of field testing we have found that this tool can be useful as a EVP recorder but while using the delay function to communicate in real time we have recieved false positives by the use of the delay function as it creates back ground mumbling of your questions. It is more complicated to use than the standard recorders. We use it now as just a standard recorder. It is difficult to hear the spirit responses and can still only verify results upon reveiw with wavepad on a PC. Laser Grid. 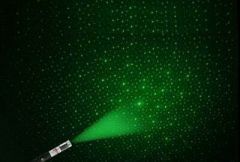 This tool allows us to sense mists and shadowy movement which would be otherwise hard to see with the naked eye. When something moves in this field it disrupts the light waves showing thickness or depth. UPDATE 2/2013-We dont use these much as the dots are so spread out in a larger room ? 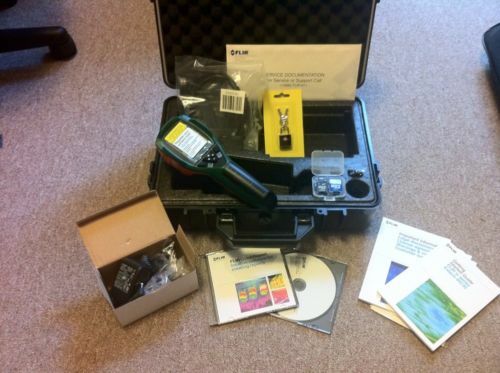 UPDATE-2/2013-The Ovilus is a tool we have used several times in the past. We have NEVER captured any credible evidence with this device in the many years of using the various models. These are in our opinion overpriced childs toys. Careful of what Television tries to get you to believe in ! 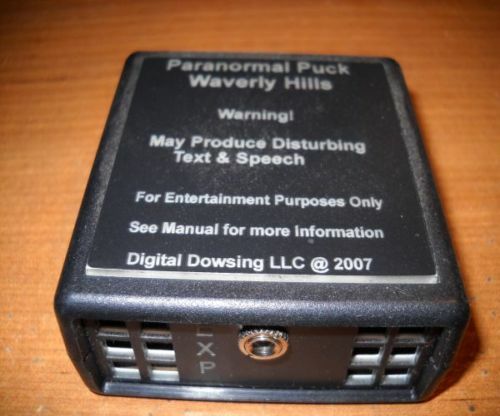 UPDATE-2/2013-The Paranormal Puck. This device is supposed to allow the user to type messages to the dead on a PC. It has never came close to rendering any credible evidence. This is our Thermasound device. This device can show you an entities movement when hooked to your Laptop PC. The device senses temperature and distance and can be set via host PC for several different modes of operation. The readout on the PC monitor will show a basic shape of the entity, it's temperature, and its movement throughout the area being scanned. We are set to begin expierments with this device in march 2012. UPDATE - 3/2013 WE have yet to capture any credible evidence with this device and continue field testing. We do not get many chances to use it as it takes a team member away of other duties to soley run the device. 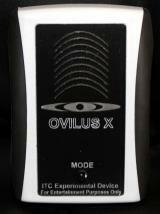 UPDATE-2/2013-This is the Video Ovilus device . Very high priced toy. We have had only one captured piece of evidence that we can call credible evidence in two years of field use. 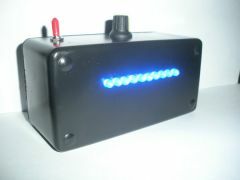 Above- Our latest addition to our collection is the newest in the line of paranormal research tools. 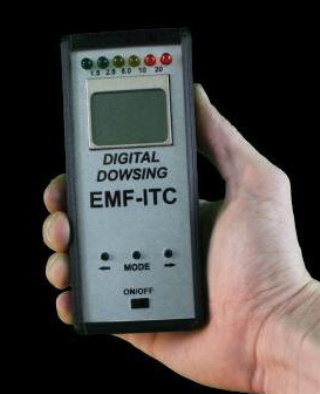 This device works as an EMF meter, Ovilus, dowsing rods, and graphs readings to show more of what you are detecting. 6 Line LCD display, 3 axis EMF sensor ,Ion/Static Sensor, Multiple display Modes, See EMF wave forms,Multiple ITC modes, Sample Frequency, True Yes No based EMF Change %, Ovilus mode text on screen only, EMF to Image capability. Could there be messages in the EMF we are detecting ? We get EVP's all the time but not as much activity on our EMF meters ? This tool will be that next step to discover why. UPDATE 3/2013- The inventor of this tool refused warranty service repairs on the 2nd unit we recieved after return first defective unit. He also refuses to properly explain the functions of this tool so we can explain exactly how it works and to have the knowledge to properly adjust it. He further cancelled our next preorder of the newest device he had devoloped in a temper tantrum and refuses any further contact. PARAWARNING- We will master this item without the manufacturers input and evaluate it's performance honestly and post the results for the public to read in an un-biased fasion. Beware of these purchases as they may provide marginal very difficult to verify credible results. 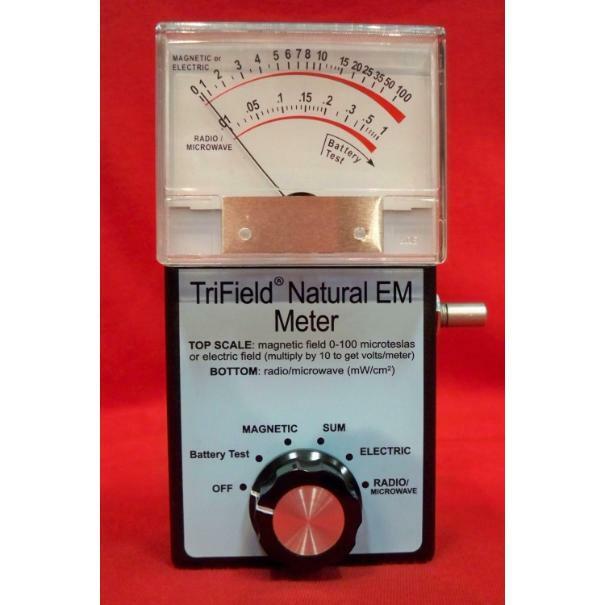 Below is pictured the Trifield Natural EM Meter - This device Ignores man made AC energy elimanating that form of false positives. It reads any change in the magnetic field , natural electrical fields, and the sum of the two can be monitored combined. It also reads Radio and Microwaves which have been mistaken for spirit activity on the K-2 and other A/C detectors. It is somewhat more complicated to use to know what you are detecting but 100% more accurate. It has and audible tone to let the user know there has been a change detected. The only drawback is no back light which I will expierment with adding an led and a switch for the light. 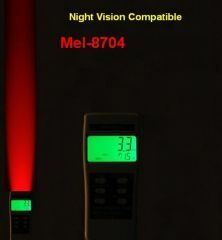 UPDATE-2/2013- This meter has proven very credible in the field if you can get people to stay away from it. recomended.